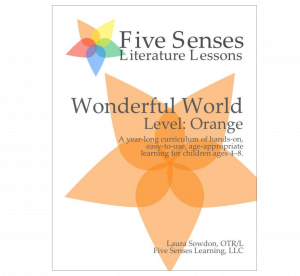 Welcome to the Five Senses Literature Lessons Store. Each of the products listed below is a PDF document that you can download to your computer or device of your choice once you purchase. The PDFs are full color and include links to videos and websites for additional resources as well as an appendix with all your worksheets and printouts you’ll need for each program. Not sure which level is right for your child? Take a look at our FAQ page where we discuss the differences in the levels and how to choose the right one. 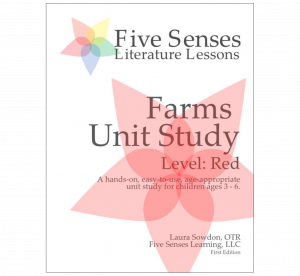 The Farms Unit Study is an engaging unit study for young children who enjoy picture books and are ready for some adult-directed learning with lots of hands-on fun. Every lesson has several hands-on activities that will help your child gain life skills while having fun learning about animals and farms. The Wonderful World curriculum is an all-in-one program for young children. If your child enjoys picture books and is ready for some adult-directed learning, this is the program for you. Every lesson has several hands-on activities covering many different subjects that will help your child gain life skills and learn about the world around them. 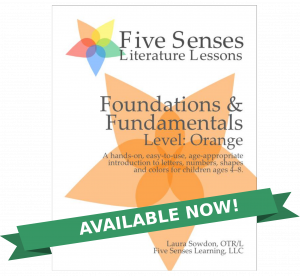 Foundations & Fundamentals is a complete curriculum designed to teach young children handwriting, phonics, math, colors, and shapes. Through beautiful picture books, fun rhymes, hands-on activities, and games, you and your child will learn about each letter, both its form and sound. You’ll also explore social skills, cooking, science and so much more. 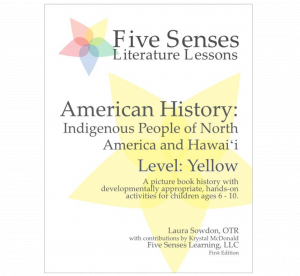 The first offering in the Yellow Level is a picture book study of the Indigenous peoples of North America and Hawai‘i. The books in this program cover a wide range of people and cultures spanning centuries of history all across North America. Through hands-on activities and engaging lessons, you and your child will build a foundation of knowledge that will provide a deeper understanding of the history of the United States. 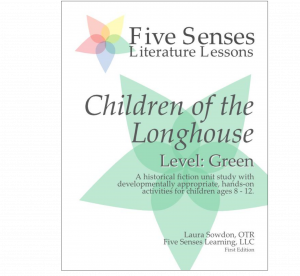 The first installment in our Green Level is a unit study of a historical fiction chapter book, Children of the Longhouse. Children of the Longhouse is a story about a young boy growing up in the Iroquois Bear Clan in the 1500s, before European colonization of the area. The book gives us insight into the stories, family life, and traditions of the Iroquois people while providing a backdrop for a wonderful, hands-on learning experience. Subscribe to our mailing list to hear about new releases! If you want to receive email notifications when new products are available for purchase, please sign up for our newsletter. You’ll receive an email when we have announcements of new products and new blog updates.